Wellen’s Syndrome is one of those syndromes that all emergency physicians know about. It’s probably also one of those syndromes that the emergency community introduced to clinicians everywhere. It was first described as an inverted U wave as early as 1980 and then introduced by Wellen in 1982 as Wellen’s syndrome, the name by which it is known today. The pattern represents a significant major coronary artery stenosis. More specifically a Left Anterior Descending(LAD) artery stenosis. In most cases this is proximal, but it may be mid or distal LAD. It is a major stenosis. If the pattern is not recognised and the patient is untreated, up to 75% of patients will have an anterior wall myocardial infarction within days/weeks. Because of this it has been called “The Widow Maker”. How to Recognise the Pattern? 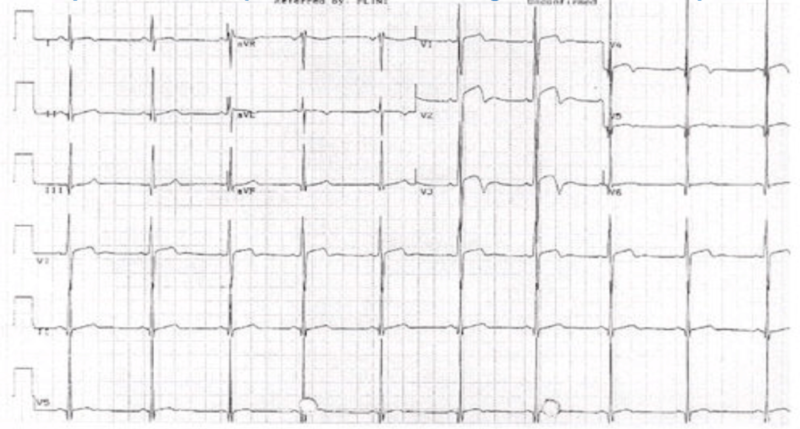 The peculiarity of this ECG pattern is that it may not appear when the patient has pain. 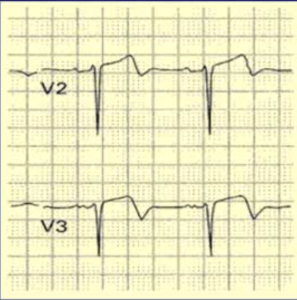 In fact the only finding when the patient has chest pain, may be a small negative deflection at the end of V1 and V2 . The T waves become deeply inverted when the patient is pain free and represents a reperfusion of the myocardium. Cardiac enzymes will be normal in most cases or mildly elevated. TYPE A: Occurs in 25% of cases. Has biphasic T waves in V2-3. A 91 yo woman presented to the emergency department with a brief episode of chest pain. On arrival she is pain free. Her ECG below demonstrates Type B Wellen’s pattern. The patient did have a troponin rise and had critical LAD stenosis. This means that she didn’t quite fit the definition of Wellen’s Syndrome. Does this matter? Of course not. With inverted T waves like this it doesn’t matter. We aren’t going to miss this patient. It’t important to not miss the forest for the trees. The patient with this ecg isn’t going anywhere. A 58 yo male presents with 2 days of intermittent chest pain. He is now pain free. His ECG is shown below. This is the Classic Type A pattern with the bi-phasic T waves. We talk about this a lot, as this is the one that is likely to be missed. The ECG machine may call this normal or a ‘non-specific’ change. Remember that most of these patients will be pain free when the ECG is abnormal and they may not have a troponin leak. BUT THEY MAY, so be careful about sticking to the exact definition. Concentrate on the Wellen’s wave form and not necessarily the other stuff. There is one case where we should beware about diagnosing Wellens. See the case below. A 35 yo male presents with chest tightness and collapse. He is now pain free. His ECG is shown below. At first glance this appears similar, with biphasic waveforms in the anterior leads. It is difficult to diagnose Wellen’s Syndrome in patients with left ventricular hypertrophy. The left ventricular hypertrophy as we know results in abnormal T waves and can mimic Wellen’s Waves. The above is an example of Pseudo-Wellens primarily because there is left ventricular hypertrophy. 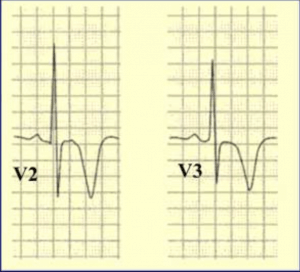 Also in Pseudo-Wellens changes are more lateral i.e.., extend beyond V3, whereas in Wellens they are usually V2-3. Patients with Wellens have a significant LAD stenosis. Medical management will not be useful here. In the Emergency Department they should have the usual aspirin and cardiology should be alerted. These patients do not need an immediate cardiac cath, nor should they get thrombolysis(they don’t meet criteria and Wellens is not a STEMI equivalent). They need a cardiac cath urgently and I would advise admission and watching. I would also advise against stress testing, unless you are eager for a CODE to be called.